How can I prepare myself to get the very most from my relationship with my web designer, and how can I make it the most productive and successful partnership possible? In the Internet world, change happens quickly. Styles evolve. Tools improve. Technologies advance. Audiences grow and learn. However, common sense approaches have not changed much over time, including the basics of business skills, logic, organization, process-based thinking, mutual trust, and respectful behavior. As a freelance web designer with over 18 years of experience developing websites for individuals, small-to-medium-sized businesses, and nonprofit organizations, I’ve developed processes, checklists, and templates to get the job done. No stone has been left unturned in uncovering every little detail of the website design process: the best ways to approach the many tasks and challenges, the common mistakes that clients make, and the things they do that can drive a web designer crazy! The material is organized in standalone sections. You can read the entire book now and get value from it, but it can also be relevant as a step-by-step resource, to be read in sections, based on where you are in the process. Reading this book will give you the tools to get the most out of a working relationship with your web designer so you can create the best website possible for your needs. 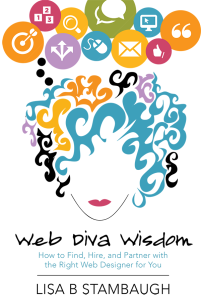 Web Diva® Wisdom: How to Find, Hire, and Partner with the Right Web Designer for You should be an essential reference for anyone working with—or planning to hire—a web designer. Its goals are to provide basic guidance for the newcomer embarking on the process for the first time, as well as to offer lessons and process improvements for those already working with a web designer. Whether you are ready to partner with a web designer for a new website, a redesign project, or major updates to an existing website, you’ll find helpful guidelines, tips, and best practices. As a client, you are ultimately the creator and owner of your website. If you don’t collaborate with your web designer and actively participate in the process, you won’t end up with the website of your dreams. Hiring someone to design your website should not be a one-time, short-term project but rather the start of a long—and hopefully productive and successful—business partnership. Let this book be your guide to getting the most out of your relationship with your current or future web designer. Sign up to receive occasional messages with tips & tricks and a free excerpt.